Here we are! 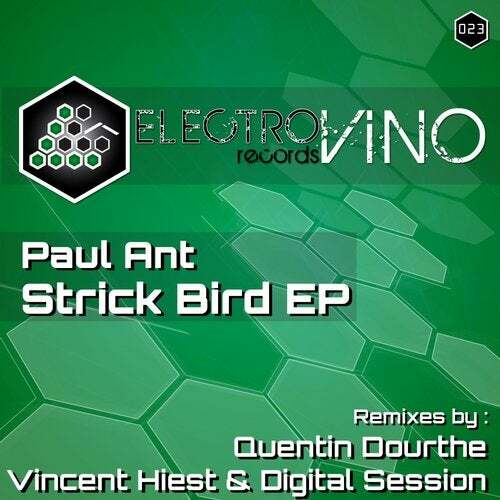 For the 23rd opus on Electrovino Records, we are pleased to welcome a new producer Paul Ant. This artist from the south of France has made two dark techno tracks under the name of Strick Bird and Reeteck. Those two pieces are both quite effective and can easily be integrated into any techno set. Furthermore, we have invited another French producer Quentin Dourthe who we have noticed on labels such as Yin Yang Records or Egothermia Records for instance. He has given us his own vision of Strick Bird and the result is a dynamic and moody remix. To finish off the release, the duo Vincent Hiest & Digital Session have participated in the project by remixing Strick Bird as well. Their re-interpretation is definitely a little bomb, which will work excellently on the dance floor.